The Flash delivers a new origin story for Killer Frost when Caitlin finally reunites with her father and Nora tries to continue building her connection with Iris by joining her on a case. I’ve been very complimentary about the handling of Caitlin this season; the writers have been giving the character very different material than she usually gets which gives Danielle Panabaker plenty of opportunity to show what she’s capable of as a performer. Instead of having Caitlin reading screens or becoming romantically involved with guest characters who may or may not be villains she is involved in some really weighty emotional stuff that makes for compelling insight into the character. The actual execution of the quest to find her father has been a mixed bag but the strength is in what lies behind the mechanics of this plot. Caitlin is afforded the opportunity to do some soul searching, encouraged to see her own past in a different light and she also takes stock of the important relationships in her life. Her friendship with Cisco has been a mainstay of the show since its inception with their dynamic being akin to a brother/sister bond. Over time this connection has been sidelined in favour of other plotting but it has always been there so using this plot as an opportunity to reaffirm that while developing it has largely justified its inclusion on its own. Caitlin finally reunites with her father in this episode and it’s problematic at best. Danielle Panabaker continues to do good work conveying the complex emotions associated with this but the writing isn’t strong enough to back that up. It immediately feels very predictable because it’s so obvious that Thomas (Kyle Secor) is hiding something. The title of the episode really doesn’t help on that score but even without that the early scenes feel like marking time before the inevitable reveal. Part of the problem is that the episode seems more focused on the mechanics of the plot rather than the more interesting emotional narrative that exists beneath the surface. Caitlin finding her father after years apart is a massive deal but it isn’t given the focus that it deserves. Any scenes that they share are more about his story not adding up than having them reconnect. The walk they take together is a classic example of that where they reminisce about the past before Thomas collapses to reveal his ongoing medical condition. Once again the more interesting thing about that scene is the father/daughter relationship but the script rushes through it to start revealing what Thomas is lying about. From here it goes completely off the rails with long winded explanations about Thomas curing his ALS with cryogenic experiments before refining the procedure and using it on Caitlin to prevent her from developing the condition. This explains how Killer Frost and her powers could exist before the Particle Accelerator explosion and adds an extra layer of mystery around why Thomas didn’t develop a similar alternate personality. It’s another example of favouring plot mechanics over emotion as there isn’t enough time to explore Caitlin’s reaction to learning all of this fairly life changing information. Another problem is that it’s not really all that interesting, any reminder of Caitlin’s split personality is unwelcome as far as I’m concerned because it hasn’t ever been interesting nor does it make any sense as it comes from pretty much nowhere. Turning it into an inherited trait does nothing to strengthen it either but it’s almost as if the writers have to stick to this because it has previously established and they can’t write themselves out of it. Caitlin feeling the absence of Killer Frost hasn’t really come up this season but now that Thomas has been introduced it is being addressed in a big way. Suddenly Caitlin misses Killer Frost greatly and has that compounded by finding her father once again. 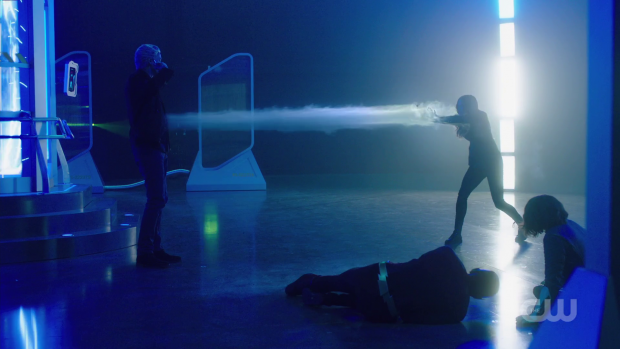 It isn’t strongly portrayed and does nothing to enhance Caitlin’s character given how poorly her connection to Killer Frost has been handled. The reveal that Thomas’ alternate personality has taken over and manipulated Caitlin to create a serum for him using her own blood was predictable in the sense that there was always going to be something more to what he was asking of her. It plays as a shock but it doesn’t land because there is no baseline for either personality to make the transition impactful in any way. When he stops pretending to be Thomas he’s overly cheesy to the point that he can’t be taken seriously which raises questions over how he could be calculating enough to carry out such a deception. His plan to use the serum in conjunction with a laser cooling system to enhance his abilities and erase the Thomas personality adds to the cheesiness as it feels unnecessarily diabolical and gets in the way of what should be an intense emotional father/daughter confrontation. Killer Frost making her return feels unearned as does her declaration that Team Flash are her family above him. Caitlin’s realisation that her father must be in there somewhere if the split personality wanted to do away from him for good so that does leave potential for a compelling story to play out in subsequent appearances. Despite all the missteps in this story there are some things that are done well. Grouping Caitlin with Barry and Cisco is a great choice because it allows the a dynamic that hasn’t had enough attention to flourish. Having them work together on a problem feels reminiscent of the first season and it feels like it has been a long time since the writers put these characters together. Arrowverse writers love a binary and regularly use characters to represent one side of an issue. In this case Barry champions Caitlin reconnecting with her father and encourages her to take the time to enjoy just being together again. His experience with Nora has made him feel more family oriented than ever and he knows what it’s like to have it work out fine when that family member has been less than honest. In some ways this has blinded him to the deception going on under his nose because he is fixated on seeing the best in people. Cisco is the suspicious one here and focuses on looking out for Caitlin. He questions everything that Thomas says and actively investigates his claims behind Caitlin’s back because making sure that she won’t be blindsided by bad intentions is his priority even if she isn’t ready to accept what he believes to be the reality of the situation. Barry does eventually start to see this point of view when Cisco challenges him to view the situation as a CSI rather than a father. Once he does that he sees the situation in a more objective light and starts to agree with Cisco. Cisco makes a lot of references to his bond with Caitlin in this episode including his lack of hesitation when it comes to suiting up and risking pain in order to help her. I’m curious if there’s a plan for Cisco to suffer massive consequences to using his abilities. The fact that Cicada using his powers also causes him a great deal of pain seems to be setting up some sort of parallel between the two by having their powers be a personal danger to them. Their motivations behind using their powers is very different but the personal consequences are certainly similar at the moment. This episode supports my theory that Cicada isn’t going to be a threat that fills the entire season. Each week reveals more information about him and I get the impression that he doesn’t have long left before the shrapnel giving him powers also kills him. Of course there’s still some work to do to explain why he hates metahumans so much but this episode suggests that an explanation could be coming soon. The speed of the development of this villain is unprecedented on this show and I can’t help but feel that there isn’t enough story to sustain a full season which works better as far as I’m concerned as having a season divided into chapters is far more successful when it comes to shows that have as many episodes as this does. Killer Frost returns – yay? The Nora, Iris and Sherloque plot has its moments but ultimately isn’t hugely interesting to watch because of how little happens. 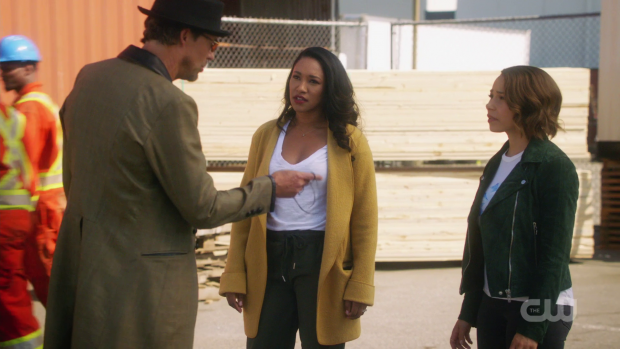 It mostly exists to give Nora and Iris some opportunity to bond after getting over some of the friction last week. It was handled well by making it feel real in the sense that Iris still doesn’t really know how to deal with Nora and isn’t sure how to put her to good use while tagging along with her. She appreciates Nora taking an interest in what she does and wanting to share in that but she also recognises that as a Speedster her skillset is better used elsewhere. Finding a way to express that without offending her is the biggest challenge which makes Sheloque useful as he has no such issue with saying what Iris is reluctant to express. 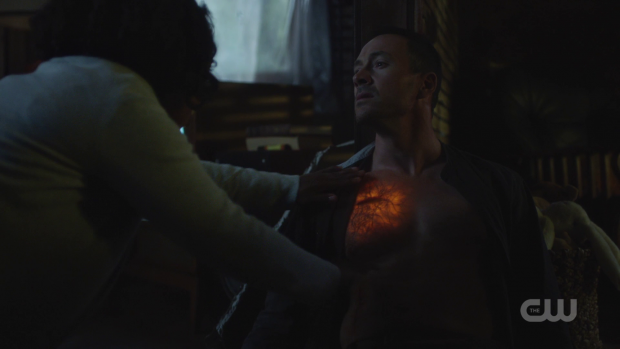 Sherloque as a catalyst that helps other relationships develop is where he can be valuable to the show and the shift in the Iris/Nora dynamic is welcomed because of the opportunities it brings to develop from here. Ralph and Cecille trying to track down Cicada at a FEMA centre that treated people after the satellite was destroyed is a reasonable enough idea that creates potential for Ralph’s detective skills to be used in meaningful ways. In theory teaming up with Cecille is a good idea and they do make for a fun pairing at times but on the whole their scenes are very painful to watch. The writers are doing a really poor job making excuses for Joe being absent and substituting him for Cecille. This week he’s out for a walk with the baby which makes Ralph consider another plan. It’s as if Joe can’t be contacted when he’s out of the house. Joe can’t be involved because the actor is on medical leave but there could be an in universe reason for him not being around that doesn’t involve half baked excuses. Cecille’s contribution to her plot with Ralph is about being intimidating and getting her confidence back which she does by using her brain. It gets the job done but I’m not sure what the point of all of it was other than to keep these characters in play. An episode with a lot of potential that fails to live up to it because of absurd plotting and misused characters. Caitlin’s desire to find her father has been a good story for her as it gives Danielle Panabaker an opportunity to deliver excellent performance, develops Caitlin down unfamiliar lines and focuses on her core relationships. Finding her father this week is messy because the episode focuses more on what is happening rather than the meaning behind it. 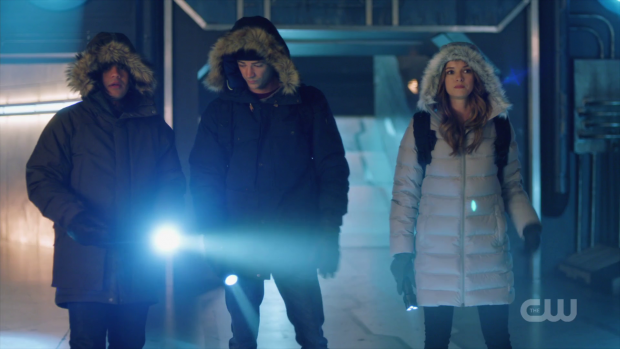 Danielle Panabaker still does strong work but the writing doesn’t support it such as the walk she takes with her father designed to give them a chance to reconnect being ended abruptly by the need to move the plot forward. It’s painfully obvious that Thomas’ isn’t being sincere as well and the resulting conflict including the return of Killer Frost isn’t earned. There’s just too much about Caitlin’s connection to Killer Frost that doesn’t work and making the multiple personalities an inherited trait does nothing to strengthen it. The reveal that Thomas has been taken over by his other personality doesn’t work because there isn’t a baseline for either persons that allows the shock to land in any meaningful way. Instead the villainous persona is overly cheesy though there is the possibility that this could get better in subsequent appearances. Barry and Cisco disagreeing over the situation works really well and it’s good to see these three characters sharing a plot as it feels like it has been a long time. Barry is focussed on Caitlin reconnecting with her father and how good that is where Cisco is constantly suspicious because he is concerned for her well-being. I wonder if the show is drawing a parallel between Cisco and Cicada as both characters feel a great deal of pain when using their abilities. The similarities basically end there as what motivates them to use their powers is so different but there is a comparison. Based on this episode I feel that Cicada doesn’t have a lot of time left considering how close to death he seems. Even though there’s still a lot we don’t know about him I feel that answers are coming soon and he will be replaced by another villain later in the season. I don’t have an issue with this as network TV shows seem to work better when there are shorter chapters throughout the season. Nora’s attempt to connect with Iris works because of how real it feels. Iris still doesn’t know how to take Nora and struggles to express her intentions when she thinks Nora would be best placed with another task. She’s clearly glad that Nora is finally taking an interest in what she does but at the same time she has the bigger picture to think about. Sherloque as the man who can say what others won’t makes for a great addition and gives him a defined role in the show that works for him. Ralph and Cecille make for a decent enough pairing even if their plot was painful to watch at times. The writers are doing a terrible job finding excuses for Joe not to be around and killing time with Cecille trying to regain her confidence really isn’t the best use of the character. The plot accomplishes what it needs to but I’m left wondering what the point of it was.